Last Wednesday, when Thomas should have gone to day-care, I made extra effort to entertain him. One big reason I'm ok with him going there two days a week is because he gets so much interaction with other children, as well as heaps of early childhood educational activities. So I had a lot to live up to today! I finally felt ready to give the painting thing a go. One thing I learnt from my days as a public school teacher is that art materials should not cost a lot of money. 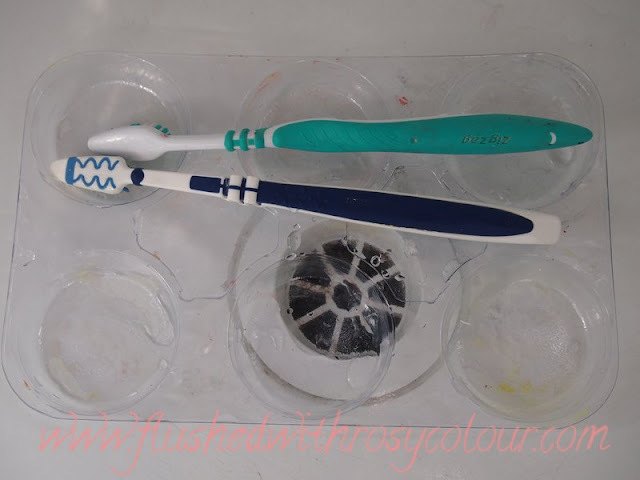 Don't throw old toothbrushes away when you replace them every 3 months. Not only are they handy for cleaning, they make great paintbrushes for little kids! I also kept this plastic tray from the packaging of a new set of 6 glasses. Isn't it excessive how much unnecessary packaging there is in everything? Help save the planet and your money but using things like that for blobs of paint. Don't buy fancy cups for your kids paints, that's just silly! 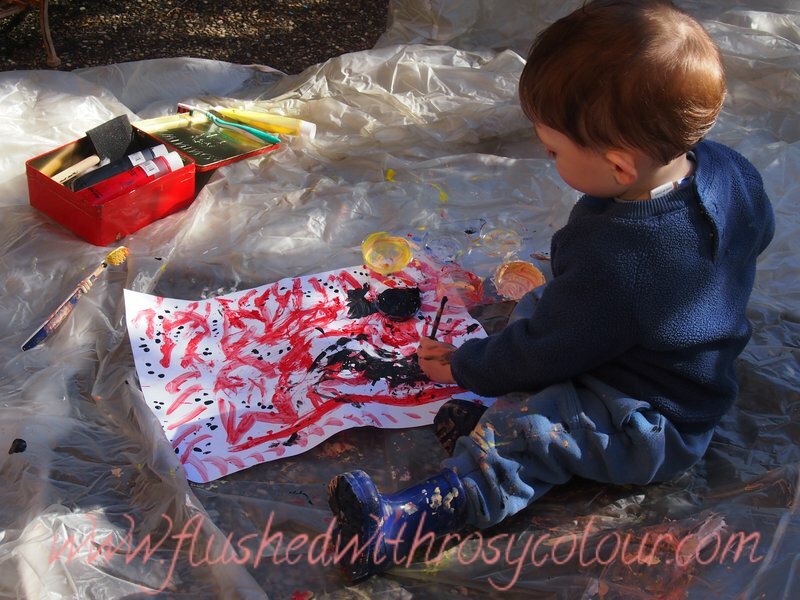 Thomas loved painting, it seemed like he must have done this before! I would say at the day care centre, or maybe my son is a natural? I used an old piece of plastic that we bought to put over our outdoor furniture as the drop sheet. Never mind that it has some splashes of paint on it now, that's decoration! I set it up under the clothes line. 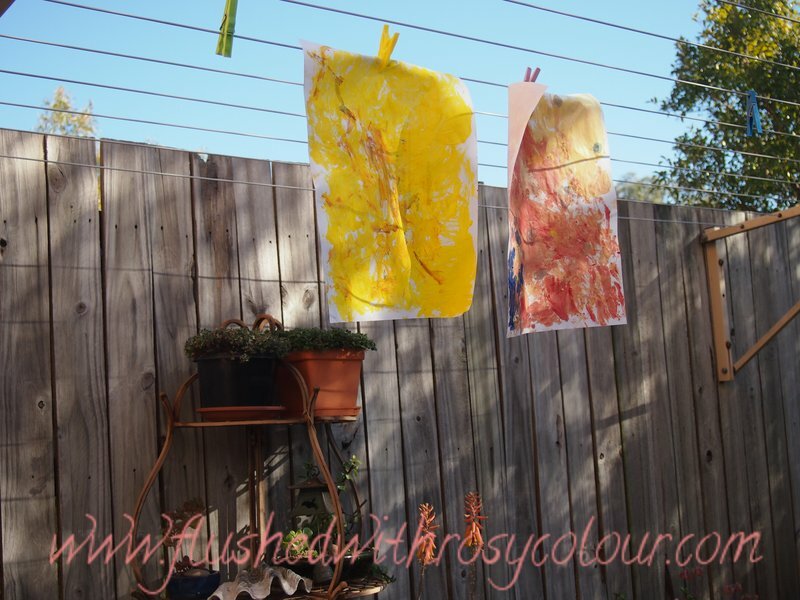 As soon as one piece of paper was painted and one colour used up, I hang it on the clothes line. When I used up the 3rd piece of paper, I got down the 1st one which had red paint on it, to add black to it. By the way, this isn't new paper of course. It's recycled A3 paper brought home from work by Tom's dad, David. And we'll be recycling this paper again now its painted, it will be turned into gift wrap! So after my experience painting with my 20 month old, I've made a short list of things to remember for next time I do this. 1. go to the toilet before we begin! 2. and get the camera ready, too! Another activity we did that day was this lentil box. 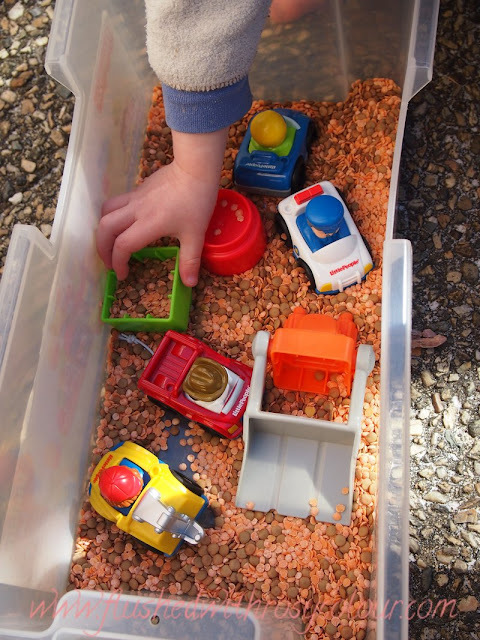 You can use lots of different materials as the earth for the little cars and trucks to push and move around. I used old lentils from the bottom of my pantry that had expired. Of course, I wouldn't use a packet of fresh lentils suitable for eating, that would be a silly waste. Just use any dry food you might otherwise chuck out like rice, lentils or beans for older children. 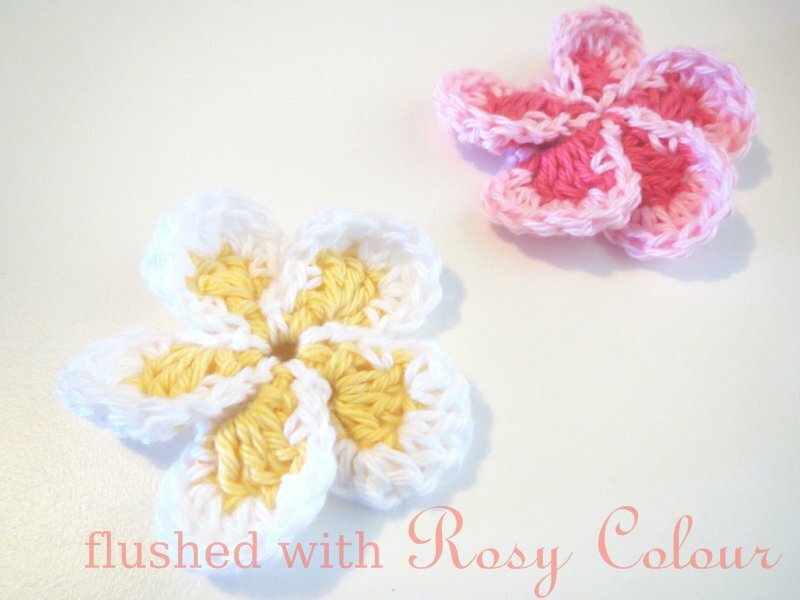 You can even colour rice with food dye. But we very rarely have rice to throw away, we always eat and it's Thomas' favourite food!